The goal of this mod is to enhance the fun and usefulness of some of the less popular dragon shouts. Now you can engage in a battle of the Thu'um with the deadliest dragons of Skyrim, and complete a quest to enchant a magic talisman that protects your companions from the harmful effects of your shouts. In particular it seemed if the player goes through the effort to find and unlock the third word of any dragon shout, it should be both fun and useful. Accordingly, the third words of several shouts have new secondary effects. Two new quests added, A Trace of Aetherium and Synearil's Legacy, which make it possible to craft the Dovah Mir, a magical talisman you can give to your follower to protect them from friendly fire damage by player shouts. Please let me know if you have any feedback or suggestions for improvement below! 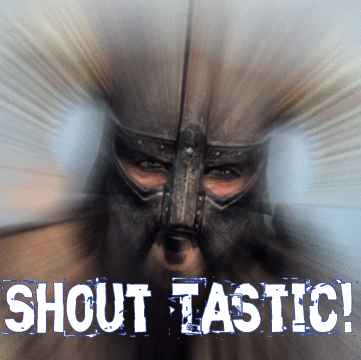 Simply unpack and drop Shout-Tastic.esp and Shout-Tastic.bsa into your Skyrim Data folder. This mod is not compatible with mods that alter dragon shouts.